OXFORD, Miss. 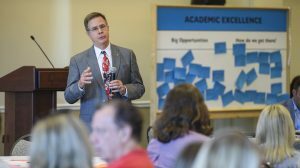 – Furthering his efforts to increase and improve internal and external communications, University of Mississippi Chancellor Jeffrey S. Vitter launched the university’s first Town Hall meeting Monday afternoon (Aug. 29). Several hundred UM faculty, staff and students joined the chancellor in the Gertrude C. Ford Ballroom at the Inn at Ole Miss for the open forum. Vitter, whose extensive use of social media and frequent interactions have earned him a reputation for being accessible, used both small-group discussions and a question-and-answer session to generate conversations about how to make what he acknowledges is already a “great university” into an even greater institution in the years to come. Participants expressed opinions and suggested ideas during the forum. Ronnie Agnew, a UM journalism alumnus who is executive director of Mississippi Public Broadcasting, served as moderator for the 90-minute session that was streamed live on the official UM YouTube channel. “I have distilled what I have heard about going from great to greater into four themes,” Vitter said in his opening remarks. “We’re here today to expand our conversations and start developing a shared vision for a greater UM. Vitter called on those in attendance to focus on four themes: academic excellence; healthy and vibrant communities; people, places and resources; and athletics excellence. Following the chancellor’s remarks, Agnew asked participants to discuss the themes, write down suggestions on color-coded index cards and post them on bulletin boards around the room. Taking questions and comments from the floor, Vitter responded to a variety of subjects, including burgeoning enrollment, the need for additional classroom space, the possibility of expanded mental health services for LGBTQI students in the wake of Mississippi House Bill 1523 and the decision to have the Pride of the South Marching Band discontinue playing “Dixie” at football games. The success of Monday’s town has left those present wanting more such gatherings during the 2016-17 academic year. While other dates and appearances have yet to be announced, the ideas gathered at Monday’s Town Hall will be compiled and shared online, Vitter said.